Grilled Cheese and Mushroom Sandwich- is easy to make and fill in the stomach at the same time. This mushroom sandwich recipe is a suitable dish that you can enjoy in the breakfast and brunch also. Made with stuffed mushrooms in bread slices and fried for perfection, this is an easy recipe and will not take much of your valuable time too. 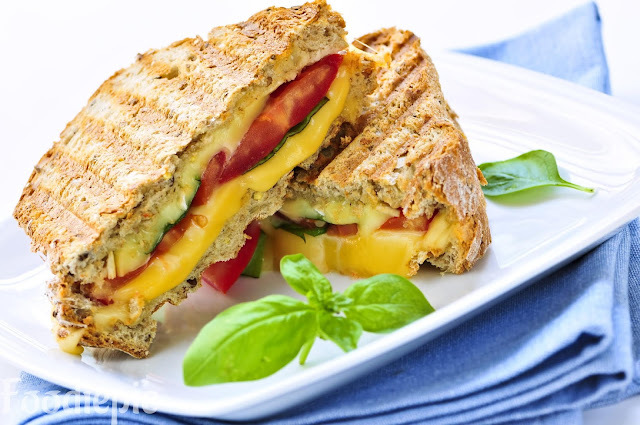 This charming sandwich recipe can be enjoyed by people of all age groups and it is quite fantastic. this vegetarian recipe has the potential to become one of your favorites.This is easy to make at home with simple steps.Let's checkout recipe first. Step 1 : Place a non-stick pan on medium flame and add 2 spoons of oil in it. Step 2 : Now, add the chopped mushrooms to the hot oil and salt saute it for 8-10 minutes, until the mushrooms dry slightly at this stage mushroom leaves water but frying until its dry. Step 3 : Once complete,add chopped Green onion, chopped green chilli,Garlic cloves, and black pepper,Salt according to your taste,Coriander leaves. Toss the mixture and cook it for some time. When done, transfer the mushroom into a bowl. Step 4 : Now, spread 6 Bread slices on a flat surface and fill each of them in equal amount of mushroom mixture.Topped it with grated cheese and cover with other bread slices.You can add some Green veggies Tomato,Lettuce or any. Step 5 : You can Grill it in toaster or Oven,But we can do it in pan,place a pan on medium flame and add 1/2 tablespoon butter in it.Let it melted and then carefully add a sandwich to it. Gril the sandwich until it becomes golden brown from both sides and once the cheese melts Take it away from the flame. Prepare all the sandwich like that. Finally : Cheese and Mushroom Sandwich is ready serve it with Tomato ketchup's or any choice of your dip and enjoy and also you can pack it for child lunch box.